Strabismus, commonly referred to as crossed eyes, is a common childhood eye condition. It can affect adults, as well, however. At the office of Christianne Schoedel, M.D., you can take advantage of our adult eye care in Hershey in order to achieve positive results when it come to strabismus. The way that this condition develops is that your eye muscles are not working in conjunction with each other in the manner that they should. As a result of this, you are not able to have your eyes both focusing on the same point at the same time. Your eyes are each sending a different image to your brain, which causes confusion. The weaker eye’s images tend to get ignored. When strabismus occurs in adulthood, which may be a holdover from undiagnosed childhood strabismus, it typically manifests in double vision, so if you are having that symptom, you should come in for our adult eye care Hershey. 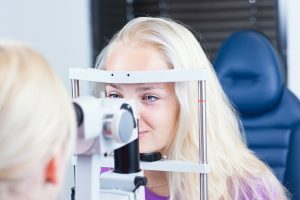 In order to diagnose the condition properly, Dr. Schoedel will conduct a complete eye exam, with specific tests done to detect alignment issues with your eyes. It is only after a conclusive determination is made that the focus turns to treatment. The good news is that while strabismus is not a desirable condition, addressing it and getting the needed results are typically not difficult. Many cases can be treated effectively with eyeglasses or an eye patch. In some cases, eye coordination exercises will be helpful. Surgery on the eye muscles is recommended only if the simpler methods are insufficient to achieve the necessary outcome. We want you, our valued patient, to be able to benefit from our adult eye care Hershey. To have strabismus, or possible strabismus, diagnosed, evaluated, and treated, all you have to do is reach out to our office now and book an appointment to come in at a time that is convenient for you.